Lupita Nyong’o is no longer a young woman who graduated from Yale, made her feature film debut in a critically-acclaimed movie, and became a fashion favorite. As of this past weekend, when she won the Academy Award for Best Supporting Actress for her unforgettable performance as Patsey in 12 Years a Slave, and when that film went on to win Best Picture of the Year, Lupita Nyong’o the person became Lupita Nyong’o the movement. And for those of us watching closely, this movement (the correct pronunciation of which you can find HERE) has great cultural significance. Attention must be paid. And so I hope that my presence on your screens and in the magazines may lead you, young girl, on a similar journey. That you will feel the validation of your external beauty but also get to the deeper business of being beautiful inside. There is no shame in black beauty. In a world where women of color are still lightening their skin, in a world where the typical black woman on screen looks like Halle Berry or Paula Patton, in a world where Kerry Washington and Gabrielle Union are considered to be dark-skinned beauties (and it is still a big deal that they are being so embraced by Hollywood), Nyong’o as a fashion and beauty icon (she’s also the new face of Miu Miu) is no small thing at all. The legacy of slavery still very much operates in our culture, and part of that legacy pertains to black women with lighter skin being labeled more beautiful and more valuable (a scene in 12 Years a Slave shows that, indeed, slave owners were willing to pay more for those enslaved blacks with lighter skin). For hundreds of years, black beauty has been defined by non-blacks, and while that is still very much happening today — even with Nyong’o’s story — it is wholly refreshing to see all shades of black beauty finally being embraced in a very public light. 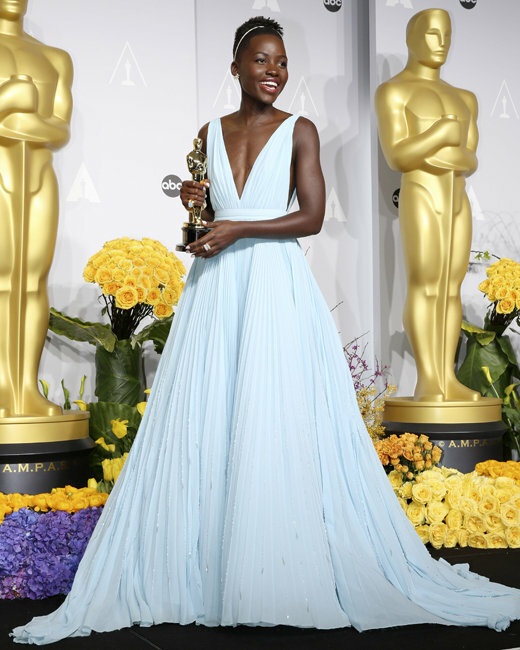 When Nyong’o hit the Academy Awards red carpet she was, of course, bombarded with questions about her gorgeous pastel-blue gown. It was designed by Prada, and — more importantly — she said that it reminded her of her hometown, Nairobi, Kenya. And wouldn’t you know it — Kelly Osbourne of E!‘s Fashion Police immediately and appropriately labeled the look #NairobiBlue, which then began trending on Twitter. It is also no small victory to see the name of an African city become equated with a thing of beauty, to become beautiful itself. But race and black beauty aren’t the only issues at play here. While many folks might have looked at her rise to fame as a rags-to-riches story, it’s important to note that Nyong’o comes from a middle-class upbringing. She prides herself on being the daughter of a Kenyan senator, and the cousin of Isis Nyong’o, who recently made the Forbes list of Most Powerful African Women. She completed her undergraduate studies at Hampshire College and earned her MFA from the Yale School of Drama. All of this to say that she is an educated, fabulous, talented force of nature. And judging by her Instagram account, she’s just as much as superfan of all things pop culture as the rest of us. Her presence in this world is huge right now, and watching her inspire young men and women everywhere makes the notion of celebrity status far more enjoyable.